Rabbits' urine varies in color from clear to yellow to brown to bright red. This is usually not a cause for alarm unless there are additional signs such as sitting and straining to urinate, loss of appetite or temperature. When you see red urine, don't panic. Just keep your eyes open for other signs that might indicate a problem. If in doubt, you can have your veterinarian test to see whether there is blood in the urine. Never let a veterinarian give your rabbit amoxicillin. It is a pink liquid antibiotic that smells like bubble gum. Amoxicillin is very dangerous for rabbits, and has killed many more than it has helped. Any penicillin-based drug can be dangerous for your rabbit, so try to find a veterinarian who is knowledgeable about rabbit-safe antibiotics, and who is familiar with the safer drugs such as Chloramphenicol, Tetracycline, sulfa-drugs based like Septra or TMS, or enrofloxins such as Baytril or Cipro. These are very bad for your rabbit and other pets. The aromatic hydrocarbons produced from softwood beddings can cause both respiratory and liver damage in rabbits and other small animals. Use organic litter in the litter box and put newspaper in the cage tray. The House Rabbit Society has had over 1000 rabbits spayed or neutered with approximately .1% mortality due to anesthesia. On the other hand, the risk of reproductive cancer (which is fatal) for an unspayed female rabbit stands at approximately 85%, which makes spaying a necessity. For male rabbits, the benefits are primarily behavioral (eliminating spraying and hormone-related aggression), but are just as important. A knowledgeable rabbit veterinarian can spay or neuter your rabbit with very little risk to a healthy rabbit. 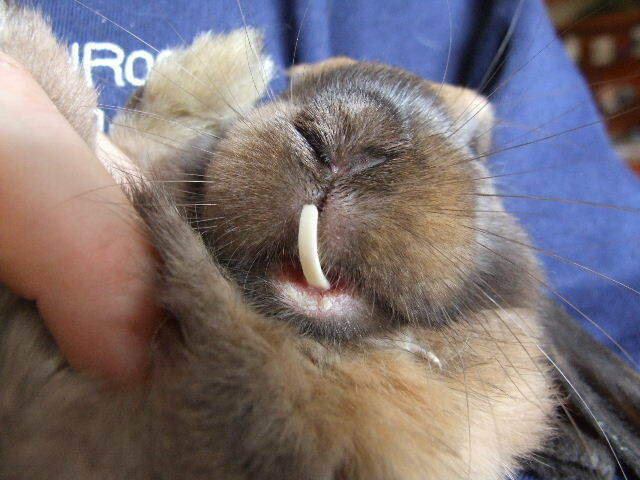 Rabbits' teeth can be misaligned. This condition is known as malocclusion, which means that a rabbit's constantly-growing teeth are not wearing down properly. If the misalignment is bad, the teeth will need to be clipped periodically so that the rabbit can eat. Your veterinarian can do this for you, or can show you how to do it at home. Usually malocclusion just strikes the front teeth, but occasionally, the back teeth can also be misaligned. One indication of this is a wet chin that is caused by drooling. If this is the case, your rabbit will need his molars trimmed by a veterinarian on a regular basis. Rabbits shed their hair every three months. Every second shedding is light, followed three months later by a heavy shedding. This is an important factor in rabbit deaths. You need to brush and comb your rabbit to get the hair off of them when they start to shed. Rabbits groom themselves like cats and will ingest all of the loose hair, which they cannot vomit as can cats. For this reason, besides regular grooming, they must have constant access to fresh hay every day, as the fiber helps the hair pass through the digestive system. You can also give your rabbit cat hairball preparations such as Petromalt or Laxatone once a week when not shedding and daily during their molt. Finally, daily exercise is another important factor in the prevention of hairballs. Make sure your rabbit is in good health prior to elective surgeries. Food and water should not be removed from a rabbit the evening before surgery! Any change in diet can upset a rabbit's sensitive digestive tract and cause problems in post- operative recovery. One of the reasons some veterinarians recommend removing animals' food before surgery is the possibility that they may vomit. Rabbits cannot throw up, thus this is not a concern. Additionally, some veterinarians are concerned about spaying rabbits with a full cecum. Unfortunately, the cecum would take 3-4 days of fasting to empty out, and by that time, the rabbit would be dead. So please, do not fast your rabbit before surgery! After surgery, make sure the rabbit's cage is clean, and check her incision site daily for swelling or discharge. Do everything you can to get your rabbit to eat again as soon as possible after returning home. To coax him to eat again, you may have to offer a variety of treats, including his regular pellets and hay. If your rabbit has not eaten for 48 hours after surgery, consult your veterinarian.